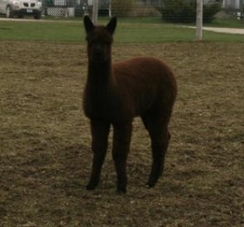 Midanna is a beautiful dark fawn female, with very correct and strong conformation. She is an attentive mom with lots of milk. All of her crias that we own are very dense with lots of crimp. Midanna's parents are both black, and when she was bred to black, she produced a lovely black cria. 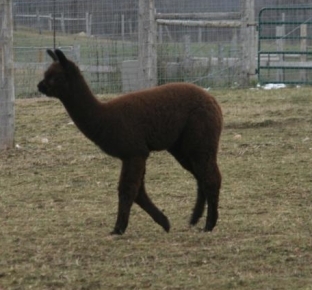 Last year when bred to grey she produced a beautiful black cria. If you are looking for black Midanna may be the girl for you. 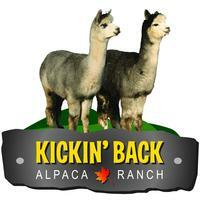 We will include a breeding to the herdsire of your choice. Markdale was born in the morning just as we were leaving to setup for the Markdale Fall Fair, hence the name. Markdale has beautiful black medium crimped fibre with a lovely shine to it. He is fairly dense and very soft. At 6 months old his fibre was already 5" long. Markdale is halter trained and attended several farmers markets this summer. As much as we love Markdale we already have 2 awesome black herdsires. His sire is our ribbon wining High Plains Elvis. Markdale is now proven. He bred two of our black females that are sisters and both of them produced lovely black males.